We don’t do cable. Never have. 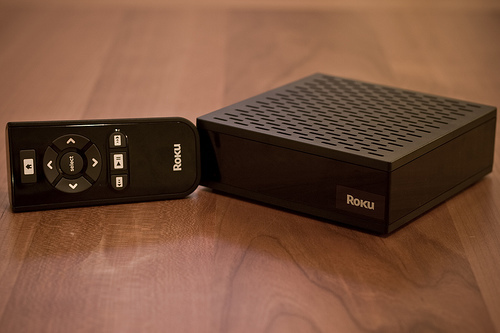 We do, however, have a Roku. The cool little box that sits beside my TV and brings me movies and TV series from Netflix (we’re currently into season three of 24 and the current seasons of Hannah Montana, Sonny with a Chance and Wizards of Waverly Place), movies that I can’t get on Netflix from Amazon for an extra fee (most recently for sleepovers: Iron Man 2 and Alpha and Omega), and current network TV from Hulu Plus (30 Rock). We watch exactly what we want — most of it without commercials — for $15 to $20 a month. Well, almost exactly. My sports fans would love to have ESPN. That’s about all we’re missing to make our TV lives truly complete. That’s where this good news comes in: Technologizer reports that Roku’s first cable channel, WealthTV, has been launched. For $2.99 a month you can watch WealthTV just as you would on cable. Not that I want to watch WealthTV, I don’t even know what it is. But if this is a sign of things to come, I’m a happy consumer. This entry was posted in gadgets and tagged gadgets, Hannah Montana, Hulu Plus, Netflix, Roku, The Roku Player, Time Warner Cable, WealthTV, Wizards of Waverly Place. Bookmark the permalink.